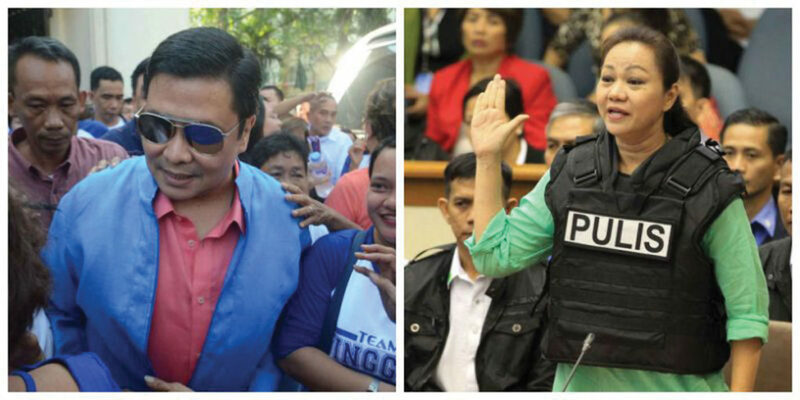 The Sandiganbayan Fifth Division on Wednesday, March 20, granted the motion for leave of court that allowed senatorial candidate Jinggoy Estrada and plunder convict Janet Lim Napoles to file a demurrer to evidence over the multibillion-peso “pork barrel” scam. “After a careful examination of the totality of the evidence presented by the prosecution, both testimonial and documentary, the court resolves to grant the present motion of the accused, to sufficiently provide him an opportunity to challenge the sufficiency of the prosecution’s evidence establishing the material elements of the offense charged to support a judgment of guilt,” the anti-graft court said as reported by ABS-CBN News. All three justices of the Fifth Division namely Associate Justices Rafael Lagos, Maria Theresa Mendoza-Arcega and Maryann Corpus-Mañalac signed the two separate but similar resolutions for both of the accused. As the Sandiganbayan approved the plea of Estrada and Napoles, they were given 10 days to file their respective demurrers, while the prosecution was given 10 days to respond. The plea could pave the way for the dismissal of the case halfway through the trial, without the accused having to present their counter-evidence. In a report from The Philippine Star, a demurrer to evidence is a pleading that challenges the sufficiency of the prosecution’s evidence against the accused. It gives the court a chance to decide if there is enough reason for the case to move forward. The anti-graft court cited Section 23, Rule 119 of the Rules of Court. According to the said rule, demurrers, if granted, is tantamount to a dismissal of the case. “A demurrer to evidence is an objection by one of the parties to the effect that the evidence which his adversary produced is insufficient in point of law, whether true or not, to sustain the issue,” the rule stated. “Thereafter, the incident shall be deemed submitted for resolution,” the court said. Estrada, who is accused of amassing P183-million worth of kickbacks for funneling his Priority Development Assistance Fund (PDAF) to bogus non-government organizations linked to Napoles, has been out on bail since September 2017. “Still the prosecution’s evidence show that accused Estrada is the main plunderer having sole and exclusive control over his Priority Development Assistance Fund (PDAF) allocation,” the prosecution said as reported by Rappler. He had repeatedly denied having any transaction with Napoles concerning his PDAF. The former senator is currently campaigning for a return to the Senate. He is one of the senatorial candidates running under the administration-backed Hugpong ng Pagbabago (HNP) slate. Napoles, meanwhile, is held at the women’s correctional facility in Mandaluyong City.